PALS has changed drastically in the last ten years, and technology and research are leading that change. Queue continuous central venous oxygen monitoring, a hallmark of the 2015/2016 PALS algorithms. Understanding ScvO2 requires a bit of understanding of physiology. Remember that, as hemoglobin molecules leave the heart after being oxygenated in the lungs, they have four molecules of oxygen attached. Out in the tissue of the body, one hemoglobin molecule is extracted, leaving the RBCs 75% saturated as they return through the venas cavae to the heart. Measurement of the level of saturation of RBCs as they return to the heart (venous oxygenation) has been done for some time, but what's new is the continuous measurement of levels. Continuous venous oxygen monitoring can be performed in two locations - the superior vena cava (venous return from the upper body) or the pulmonary artery (which contains venous blood from the upper body, lower body, and coronary veins). When the catheter is placed in the SVC, we call the resulting value "ScvO2" (saturation of central venous oxygen). When the catheter is placed in the PA, we call the value "SvO2" (venous oxygen saturation). PALS algorithms utilize ScvO2. ScvO2 levels are always 5 to 10% higher than SvO2 levels, but thankfully for us, they correlate exactly. Why does AHA use ScvO2 instead of SvO2? 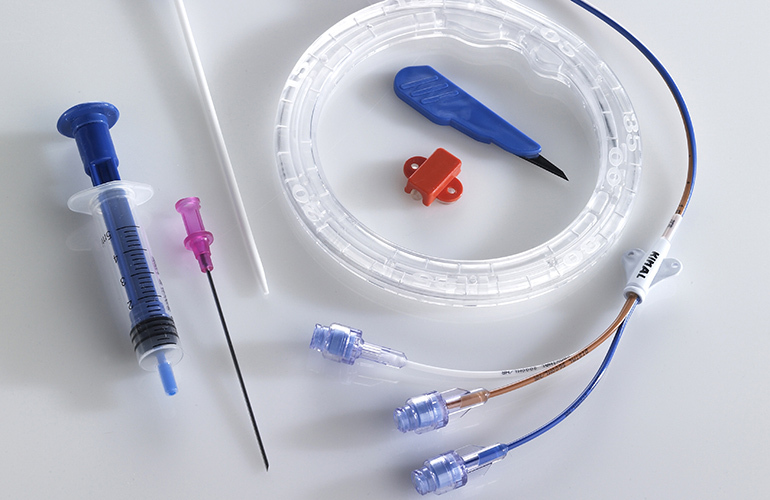 Most critically ill patients will require the use of a central line anyways, and a triple lumen central venous catheter with fiber optic ScvO2 measurement can be placed, saving the patient from more invasive PA line placement. The most accurate ScvO2 catheters use three wavelengths of light, which can measure oxygenation independent of hemoglobin levels. All that being said, the obvious question that remains is, "Why do I care about ScvO2? I have other parameters at hand." The answer is both simple and profound. ScvO2 gives you an indication of oxygenation problems earlier than any other parameter. To spell this out, continuous ScvO2 monitoring can tell you about increased oxygen consumption (due to infection or hyperthermia), decreased CO (due to hypovolemia or sepsis) or decreased oxygen supply (due to respiratory failure) FIRST. The normal range of ScvO2 is 70-80%. When values drop by 10% or below 70%, intervention is indicated. The patient still compensates for decreased oxygenation in the 50-70% ScvO2 range, at which point other parameters may still not show warning sings. By the time other parameters (SpO2) do, damage to tissues is already occurring. At Chicago Heart Training we believe active medical practice should be supported by a foundation of rigorous research in medicine and health care practice. Our staff engages in regular investigation of trending issues in medicine and provides research-backed opinion articles to enrich your medical tastes.